Professor Liu Zhengde is a noted sculptor from Wuhan, China. He is unique among Chinese artists in that he is fully engaged in contemporary artistic trends and issues, while at the same time creating works that are uniquely Chinese. His sculptures reflect issues with the current world community yet also deal with the history and traditions of China. Liu's work was featured in a recent book on public art in China. " The best example I found of an artist using twentieth-century stone carving aesthetic and techniques to explore ancient tranditional subjects was Liu Zhengde. He is one of the most artistically adventuresome artists of his generation." (John T. Young, Contemporary Public Art in China, University of Washington Press, Seattle and London, 1999). "Liu is most widely known throughout China for his depictions of Chinese fables that express moral teachings. In the 1980s, Liu was able to realize his dream of creating a series of sculptures illustrating these legends, the plans and drawings of which had been hidden under his bed in the 1970s. Eight of his unique granite sculptures now populate East Lake Park in Wuhan. His works contain subtle layerings of meaning and wit that could be read as commentary on bureaucracy and social issues". Liu is the retired Chairman of the Sculpture Department at the Hubei Fine Arts Academy. He is the recipient of numerous awards and prizes. 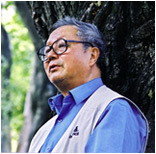 Liu is one of the few Chinese sculptors in the past 50 years to receive the prestigious Best City Sculpture Award. He received first prize in a national design competition, Hundred Flower Award, in 1986. Liu also received the Chu Yuan Art Award for being the best artist in Hubei Province. His Yellow Crane Coming Home sculpture was chosen in 1997 to represent Hubei Province as a gift to Hong Kong for its return to China. Liu's public sculptures are found in Tienanmen Square, Bejing; East Lake Park, Wuhan; Wuhan University; Wuhan; Changshu City, Jiangsu Province; Yichang City, Hubei Province; and Guangzhou, Canton. His sculptures have been exhibited in the National Gallery of Fine Arts in Beijing and Museums and galleries in Taiwan, Hong Kong and Moscow.